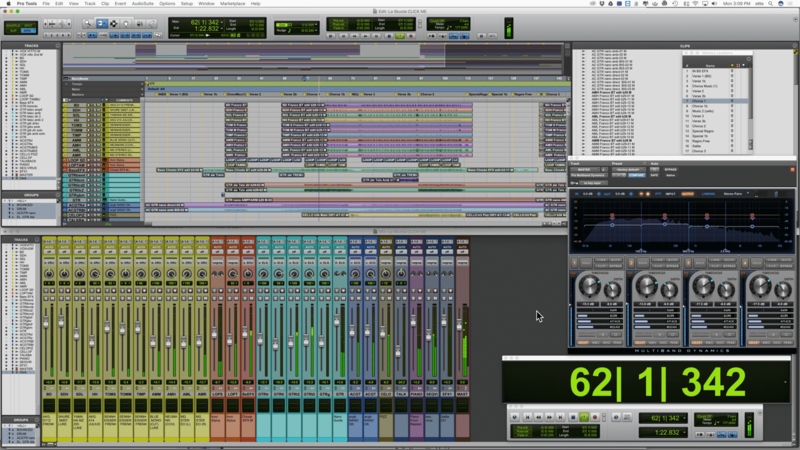 Fundamentals of creating and arranging music using the latest features of Pro Tools 12; this course covers basic principles and the procedures to complete Pro Tools sessions from initial set-up to final mix-down which includes techniques of MIDI recording and editing, digital audio recording and editing, mixing and the use of plug-in processing effects. Students apply techniques learned in class to project recordings supervised by the instructor. Of interest to songwriters, composers, audio producers, and audio engineers, you walk through the process of creating an actual song from A to Z, from developing the idea to its final delivery and back up! Our roster of certified trainers and Grammy-winners use step‐by‐step, project‐based instruction and straightforward explanations to teach everything from basic music creation to advanced production techniques. Select, navigate and perform basic editing. Sharing and learning from a legendary Producer/Engineer is priceless and incredible. Affordable classes with a lot of knowledgeable teachers that are down to earth and easy going... amazing teachers. The instructor was great. He was extremely good at explaining things and always gave us enough time to put what we were learning into practice. Most importantly, he is passionate about music and actually enjoys teaching which really makes the whole experience very enjoyable. It’s a great school and have great teachers. Some schools care only about fancy gear in the classroom and forget about the essential: the teachers!